This year I am raising money to help one of my greatest hero’s Ernie Moss, who now suffers from Pick’s Disease, a rare form of progressive dementia with similarities to Alzheimer’s. Home / Blog / This year I am raising money to help one of my greatest hero’s Ernie Moss, who now suffers from Pick’s Disease, a rare form of progressive dementia with similarities to Alzheimer’s. My name is Zoe Edg e, I would like to tell you a bit about myself, my project The Edgey Dares Challenge and about one of my greatest hero’s Ernie Moss, who now suffers from Pick’s Disease, a rare form of progressive dementia with similarities to Alzheimer’s. I was born in 1974 with Athetoid Cerebral Palsy; I attended Fountaindale special school and then went to mainstream college. I use a powered wheelchair. I have quite a severe speech problem, most of the time I get people who know me well to translate for me. I use my right thumb to work my computer. I need assistance with almost everything including feeding, dressing, bathing. I was eight when I started swimming at regional and national level. I was ten when I won a national competition. 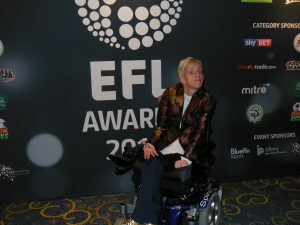 I was the top woman at wheelchair slalom in England for 5 years. I started playing Boccia at a national level when I was 12 and I went to my first international competition at the age of 14. I played Boccia for 17 years and competed in 13 International competitions all over the world. Reaching the top was very hard work, I spent long days training, travelling and fundraising. I could never have achieved what I have without the dedication and endless help and fantastic support from my family and friends. I have achieved so much through my career, winning numerous National competitions in swimming, athletics and Boccia, including 4 International medals. 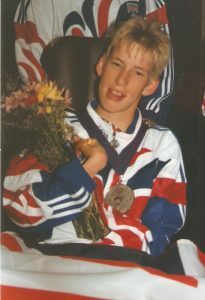 My greatest achievements were winning a World Bronze and a Paralympic Silver medal. Through this, I have been invited many receptions including one at 10 Downing Street. I’ve also met many famous people, including the Queen. After a successful career in sport, I retired from competing some years ago, since then I have given presentations about my sport in schools and groups. I am wanting people to challenge me and sponsor me to do funny things and dare me to do activities I’m up for pretty much anything, apart from reptiles. All “The Edgey Dares Challenges” will be to raise money for the charities of my choice. All my challenges will be videoed and will be available to see on my websites, Facebook, Twitter and YouTube! 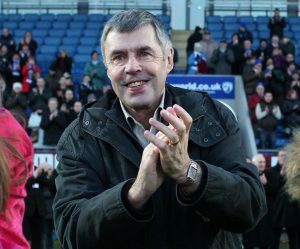 I am a lifetime supported of Chesterfield Football Club and I would like to tell you about one of my greatest heroes, Ernie Moss! 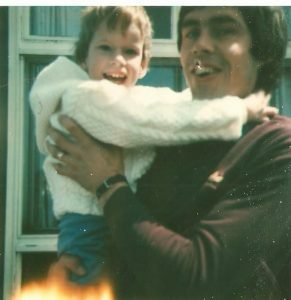 I think I was about five or six when I first met Ernie, I am about that age on the first photo taken with him and that’s when I started going to see Chesterfield play football at Saltergate. 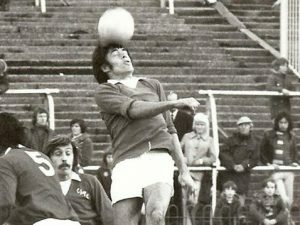 I think I liked Ernie because he was the one who always scored the goals and I could sing his song “Ernie, Ernie, Ernie!! !” and so that’s how he became my favourite. 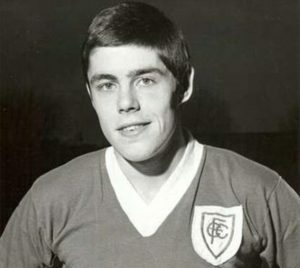 My first few Chesterfield football shirts always had number 8 on the back because that was Ernie’s number. I had a teddy bear in a Chesterfield kit that had number 8 on the back of its shirt and I had a guinea pig named after him. I remember Ernie taking me into the home dressing room at Saltergate when I was about 11, the lads thought that I was a boy, Ernie had to quickly tell them that I was a girl, because most of them had nothing on. (It didn’t bother me at all!) 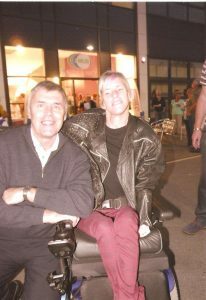 Ernie helped do some fundraising for one of my wheelchairs, he came to my 13th birthday party and I have had a birthday card from Ernie and his family ever since. Ernie and his family are all lovely people, his eldest daughter Nikki, is the same age as I am and his youngest daughter Sarah is a couple of years younger than me, so we have been great friends since we were little kids. Ernie Moss Chesterfield Football Club’s favourite son, legend and the top striker. The Spireites’ greatest player. Record goal-scorer. Played 850 professional games. A hero.” Whenever Ernie attends a home game. It takes 15 minutes to get from the car into the ground with people wanting pictures and autographs. Ernie suffers from Pick’s Disease, a rare form of progressive dementia with similarities to Alzheimer’s. Like the families of many popular ex-players who have suffered mental health issues in retirement. Now 67, Ernie has barely aged to look at since he retired in 1992 and he is instantly recognisable to any Spireite! Although Ernie doesn’t speak and understand that much now, whenever he sees me, it is very clear to see that he still recognises me, even though he doesn’t know my name. My fundraising charity for 2017. When you see how the illness Picks Disease effects the man that has been a lifelong friend and your greatest hero since childhood, it is heart-breaking. Then you see how his family deals the situation it is uplifting and you become inspired to want to help in some way. Therefore, any fundraising that I do in 2017 will be for Ernie and to help his family look after him in the future. Ernie Moss always has been and he always will be one of my greatest heroes! ERNIE, ERNIE, ERNIE!!! Sponsoring an event or activity. Sponsoring me to do a dare or challenge. Getting involved, taking part and helping at an event. Providing equipment for an event. Providing entertainment at an event. Providing prizes for an event. Helping with printing, advertising, media coverage, etc. Many thanks for your time, I would really appreciate it and it would be great if you could help in anyway. ← Living the Life of Zoe Edge Blog 4 Summary of 2016.